The Grange is available and affordable for group meetings, family functions, private parties, and public events all year round. 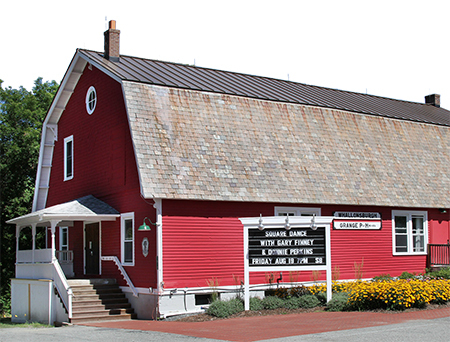 In the past year organizations and individuals have rented the Grange for business meetings and conferences, fundraising dances, readings, baby showers, family reunions, rummage sales and craft fairs. We can help with ideas to make your event a big success! Call the Grange at 518-963-7777 or e-mail us at admin@thegrangehall.info for more information and to inquire about availability and rates. A beautiful, heated and air-conditioned main hall with balcony. Seating capacity: Up to 130 lecture-style, with 100 seats on the main floor and 30 in the balcony. Tables and chairs: Six 8-foot and six 6-foot rectangular folding tables. 100 comfortable and stackable chairs. Stage: We have a large stage with professional lighting and in-house audio system. Historic painted curtain closes off stage when it is not in use. A trained technician is required to operate the audio system. Equipment specifications provided on request. Restrooms: There are two restrooms on the main floor, one of which is ADA-accessible. ADA Access: There is an ADA-accessible ramp from the parking lot into the Main Hall. Audio-Visual: Laptop projector and portable screen for presentations. Easy-to-use, portable audio system with floor microphones and speakers for meetings. It can also be connected to a portable music system (IPhone, laptop). HD projector (fixed installation) with a digital sound system for playing DVDs or for presentations using a laptop. We have a large movie screen permanently installed above the stage. A trained technician is required to show films using our HD projector and screen. Additional equipment is available for use including coffee brewer, dining ware, serving platters and tablecloths. Let us know what you need. Multi-purpose room: This room can be set up with tables or meeting style. 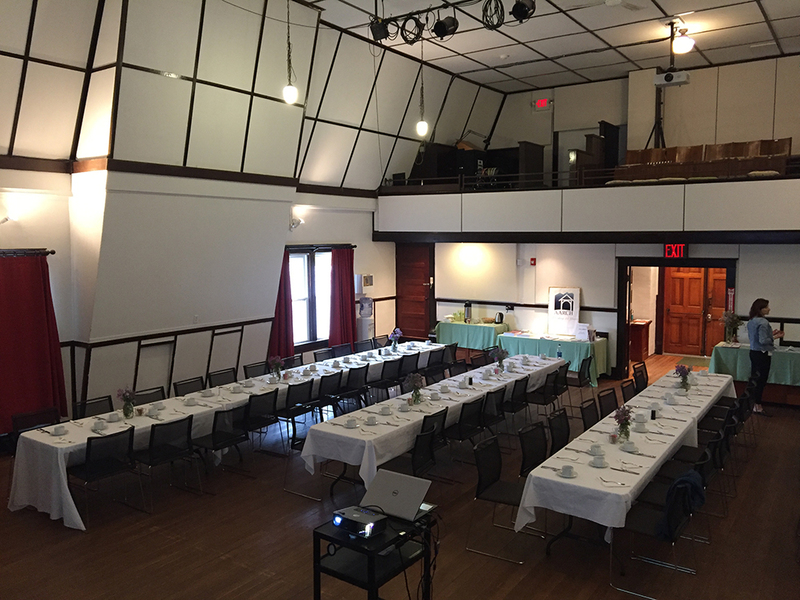 It's a nice space for meetings, lectures, luncheons, or smaller gatherings and provides a separate space when full use of the building is needed for larger events. This room has a separate ADA-accessible entrance and bathroom. Kitchen: The certified commercial kitchen is on this floor with direct access to the Multi-Purpose Room. Details about equipment and rental use is on our Kitchen page.